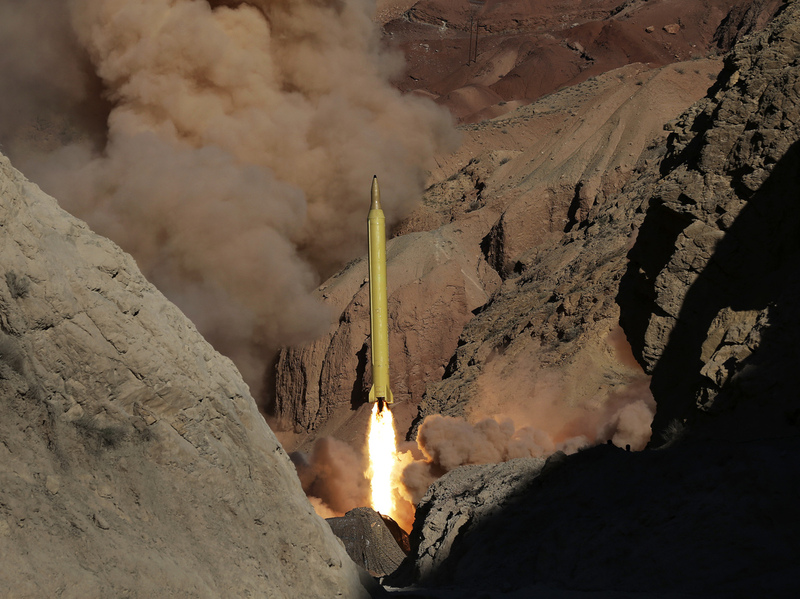 Iran Tests 2 Ballistic Missiles Reportedly Designed To Reach Israel : The Two-Way The tests may violate a U.N. Security Council resolution barring Iran from test-firing missiles capable of carrying nuclear weapons. Iran says the missiles aren't designed for nukes. A ballistic surface-to-surface missile is fired by Iran's Revolutionary Guard, during a maneuver, in an undisclosed location in Iran on Wednesday. Iran's military tested two ballistic missiles Wednesday, and an Iranian officer says the missiles are designed to reach Israel, according to an Iranian news agency. Iran has conducted a number of other ballistic missile tests this week. The tests, which come after Iran won sanctions relief in January by curbing its nuclear program, seem to be "aimed at demonstrating that Iran will push forward with its ballistic program," The Associated Press reports. "Iran says its missiles aren't designed for nuclear weapons. The U.S. says Iran's missile program is not part of last year's nuclear agreement, but Iran has warned that any new sanctions could mean an end to the deal." Iran's Press TV has video of the ballistic missile launch on its website. You can watch it here. As Reuters reports, "the missile tests underline a rift in Iran between hard-line factions opposed to normalizing relations with the West, and President Hassan Rouhani's relatively moderate government, which is trying to attract foreign investors to Iran." Additionally, the Islamic Revolutionary Guards Corps "maintains dozens of short and medium-range ballistic missiles, the largest stock in the Middle East." Iran denies that this test was "provocative," according to the wire service. White House press secretary Josh Earnest told journalists that the reported missile launches underscore the importance of the nuclear deal with Iran. "Iran is working aggressively to try to enhance their ballistic missile capability, and preventing them from being able to nuclearize their missiles is — is obviously important to our national security here in the United States," he says. Earnest adds that it "would not be a surprise if there are additional launches over the next several days." NPR's Michele Kelemen says the State Department and the White House are taking a "cautious line" on the missile test. The State Department says "Secretary of State John Kerry raised this in a phone call with his Iranian counterpart," Michele reports. Hillary Clinton took a harder line than the current administration. She said in a statement that Iran's "blatant violation" of the Security Council resolution should have "consequences." She adds: "Iran should face sanctions for these activities, and the international community must demonstrate that Iran's threats toward Israel will not be tolerated."